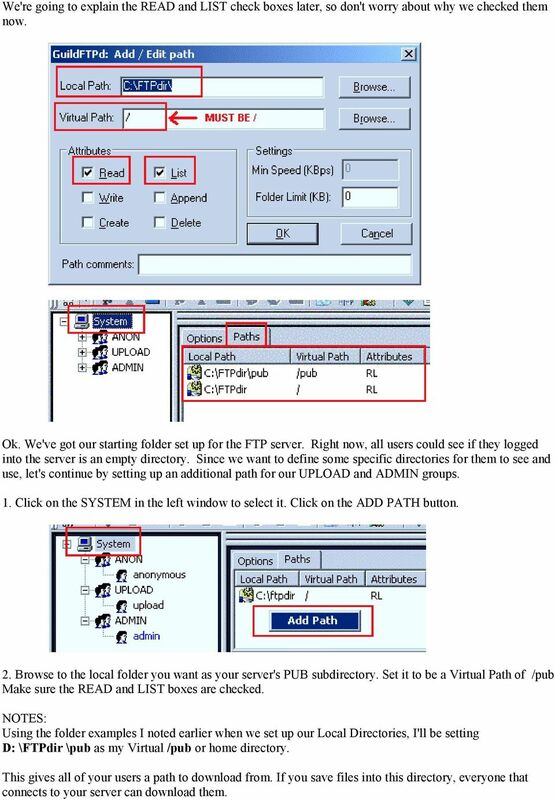 Download "Setting Up Your FTP Server"
1 Requirements:! A computer dedicated to FTP server only! Linksys router! 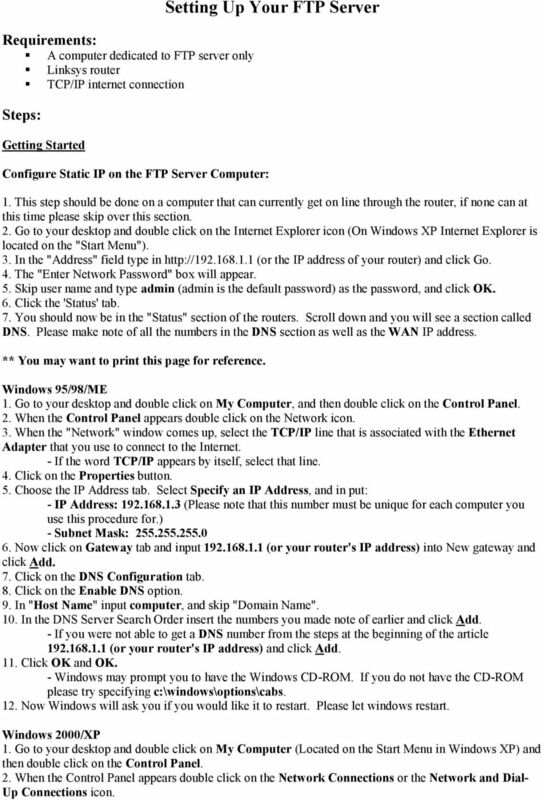 TCP/IP internet connection Steps: Getting Started Configure Static IP on the FTP Server Computer: Setting Up Your FTP Server 1. 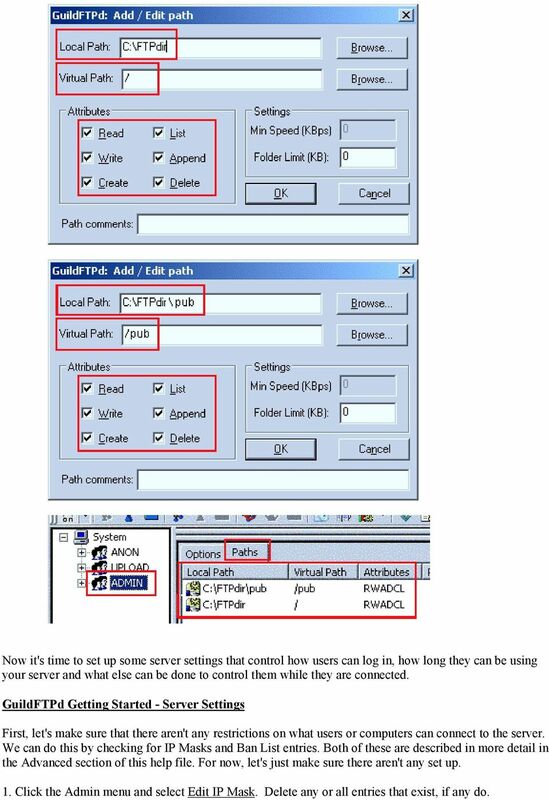 This step should be done on a computer that can currently get on line through the router, if none can at this time please skip over this section. 2. Go to your desktop and double click on the Internet Explorer icon (On Windows XP Internet Explorer is located on the "Start Menu"). 3. In the "Address" field type in (or the IP address of your router) and click Go. 4. The "Enter Network Password" box will appear. 5. Skip user name and type admin (admin is the default password) as the password, and click OK. 6. Click the 'Status' tab. 7. You should now be in the "Status" section of the routers. Scroll down and you will see a section called DNS. Please make note of all the numbers in the DNS section as well as the WAN IP address. ** You may want to print this page for reference. Windows 95/98/ME 1. Go to your desktop and double click on My Computer, and then double click on the Control Panel. 2. When the Control Panel appears double click on the Network icon. 3. When the "Network" window comes up, select the TCP/IP line that is associated with the Ethernet Adapter that you use to connect to the Internet. - If the word TCP/IP appears by itself, select that line. 4. Click on the Properties button. 5. 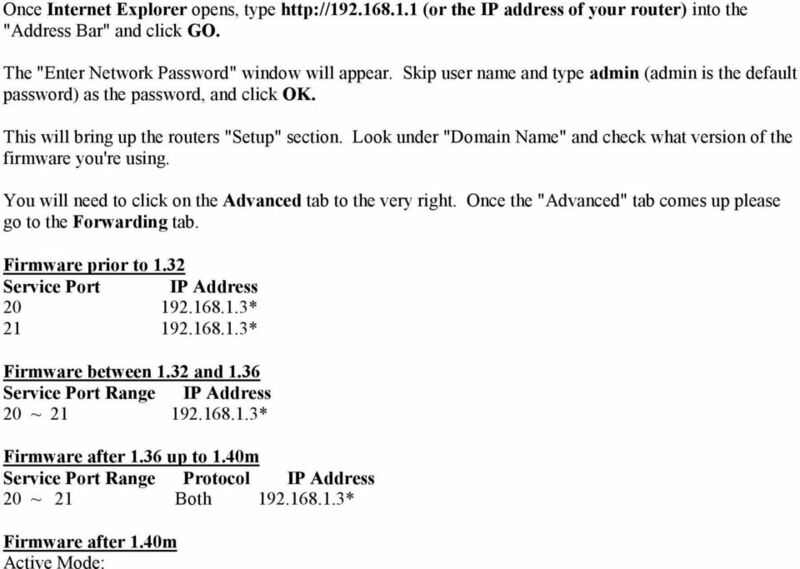 Choose the IP Address tab. Select Specify an IP Address, and in put: - IP Address: (Please note that this number must be unique for each computer you use this procedure for.) - Subnet Mask: Now click on Gateway tab and input (or your router's IP address) into New gateway and click Add. 7. Click on the DNS Configuration tab. 8. Click on the Enable DNS option. 9. In "Host Name" input computer, and skip "Domain Name". 10. In the DNS Server Search Order insert the numbers you made note of earlier and click Add. - If you were not able to get a DNS number from the steps at the beginning of the article (or your router's IP address) and click Add. 11. 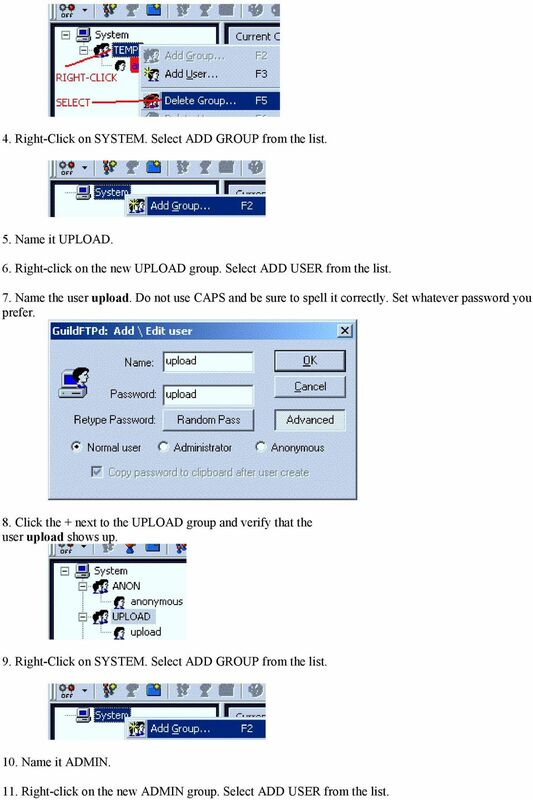 Click OK and OK. - Windows may prompt you to have the Windows CD-ROM. If you do not have the CD-ROM please try specifying c:\windows\options\cabs. 12. Now Windows will ask you if you would like it to restart. Please let windows restart. Windows 2000/XP 1. Go to your desktop and double click on My Computer (Located on the Start Menu in Windows XP) and then double click on the Control Panel. 2. When the Control Panel appears double click on the Network Connections or the Network and Dial- Up Connections icon. 2 3. Double click on the Local Area Connection that controls your Ethernet Card (Usually the first listed). 4. "Local Area Connection Status" will appear. Click Properties. 5. Select the Internet Protocol (TCP/IP) and click Properties. 6. 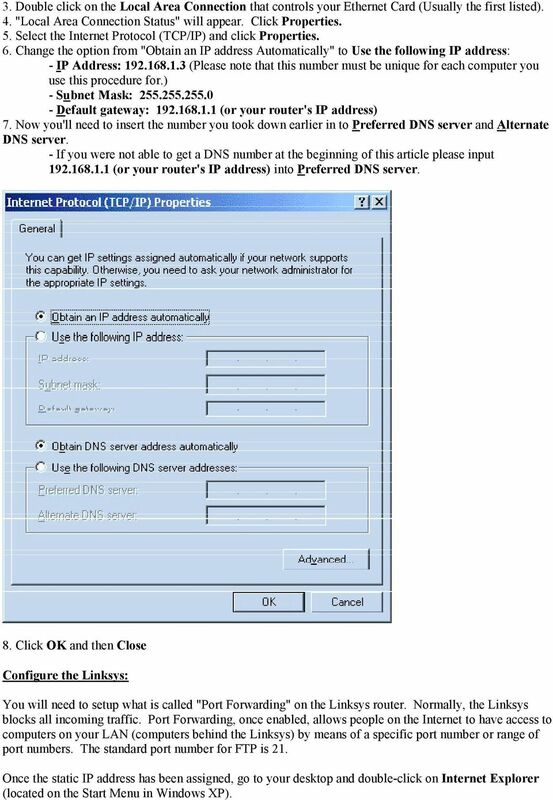 Change the option from "Obtain an IP address Automatically" to Use the following IP address: - IP Address: (Please note that this number must be unique for each computer you use this procedure for.) - Subnet Mask: Default gateway: (or your router's IP address) 7. Now you'll need to insert the number you took down earlier in to Preferred DNS server and Alternate DNS server. - If you were not able to get a DNS number at the beginning of this article please input (or your router's IP address) into Preferred DNS server. 8. Click OK and then Close Configure the Linksys: You will need to setup what is called "Port Forwarding" on the Linksys router. Normally, the Linksys blocks all incoming traffic. Port Forwarding, once enabled, allows people on the Internet to have access to computers on your LAN (computers behind the Linksys) by means of a specific port number or range of port numbers. The standard port number for FTP is 21. Once the static IP address has been assigned, go to your desktop and double-click on Internet Explorer (located on the Start Menu in Windows XP). 5 Finishing up Click Apply, then Continue. Restart your computer. Setting Up FTP Software There are many free programs to manage a ftp server. One that we have found works well is GuildFTPd. It can be downloaded at Once you have downloaded and installed GuildFTPd, follow these steps to set it up: 1. Go to the menu bar and click Admin then Options the click the Advanced settings tab shown below. 2. Click on the button named Custom IP. 3. In the box labeled Real IP address enter the WAN IP of your Linksys router or your dynamic DNS name you have signed up for. 4. 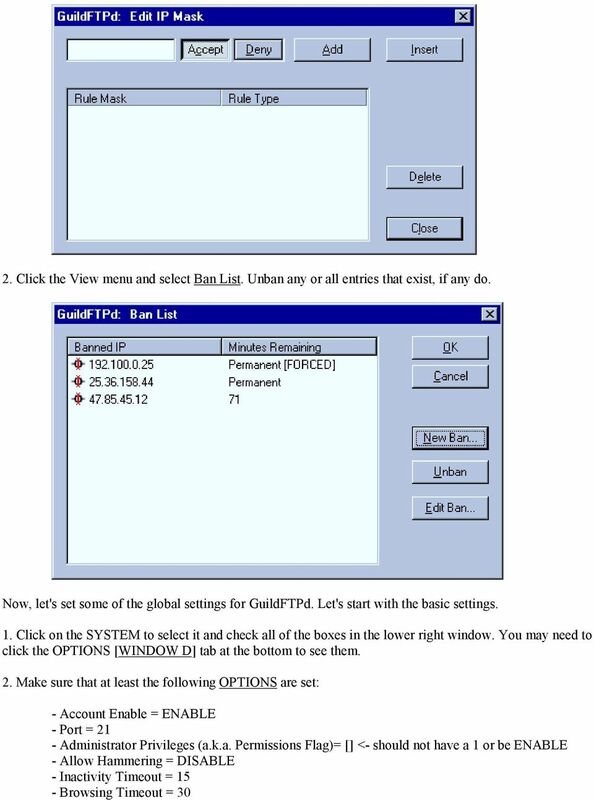 Then set the Port range to match the range you entered in Linksys forwarding setup page. 6 5. Click Ok. GuildFTPd Getting Started - Local Directory Setup Before we set up users and options in GuildFTPd, we should set up some local directories that will hold the files we share in GuildFTPd. Let's start by creating a new folder. 1. Open My Computer or Windows Explorer. 2. Open the drive you want to create your root folder in. 3. Click the File menu and select New -> Folder. 4. Name it FTPdir. 5. You should now see a new directory named FTPdir. Ok, now you have a data directory set up that can be used for GuildFTPd. Now, let's set up some subdirectories (These will hold files, after we set up Virtual Directories, later in the setup). We're going to set up the following directories: C: \FTPdir \pub C: \FTPdir \upload 1. Open My Computer or Windows Explorer. 2. Open the drive you created FTPdir in. 3. Open the FTPdir directory. 4. Click the File menu and select New -> Folder. 8 Ok, we now have some directories set up that we can use with GuildFTPd. Now, let's set up some users in GuildFTPd. GuildFTPd Getting Started - User & Group Setup Before we continue, let's think of some names to use for our users and groups. If you want anyone to be able to log into your server, you want to create a user named ANONYMOUS. That's our first user. Our second user will be UPLOAD. Our third user will be ADMIN. So, we're going to set up the following users... UPLOAD ADMIN In order to keep them separated and easy to manage later, we need to set up some groups for these users. Let's create an UPLOAD group for UPLOAD and an ADMIN group for ADMIN. ** Please note that we will not be setting up an anonymous group or user so ignore these on the screenshots. 1. Start GuildFTPD. 2. Click the + next to SYSTEM (in the left window) to see the default installed GROUP. Click the + next to GROUP to see the default USER, ANONYMOUS. 3. Right-Click on the GROUP and select DELETE GROUP from the pop-up list. 9 4. Right-Click on SYSTEM. Select ADD GROUP from the list. 5. Name it UPLOAD. 6. Right-click on the new UPLOAD group. Select ADD USER from the list. 7. Name the user upload. Do not use CAPS and be sure to spell it correctly. Set whatever password you prefer. 8. Click the + next to the UPLOAD group and verify that the user upload shows up. 9. Right-Click on SYSTEM. Select ADD GROUP from the list. 10. Name it ADMIN. 11. Right-click on the new ADMIN group. Select ADD USER from the list. 11 Now, we're going to decide how our users can see and use those directories. First, we're going to decide that we want C: \FTPdir to be our starting point for every user and group. It's going to be our root FTP path. We want all of our users to use this as the starting point. Setting up the root path / on the SYSTEM gives all groups and users a starting point when they connect to the server. We can change this for each user or group, but setting a root on SYSTEM is an easy way to make sure that every user that logs in has somewhere to start. 1. Click on the SYSTEM in the left window to select it. Right-click in the path window and select Add Path. 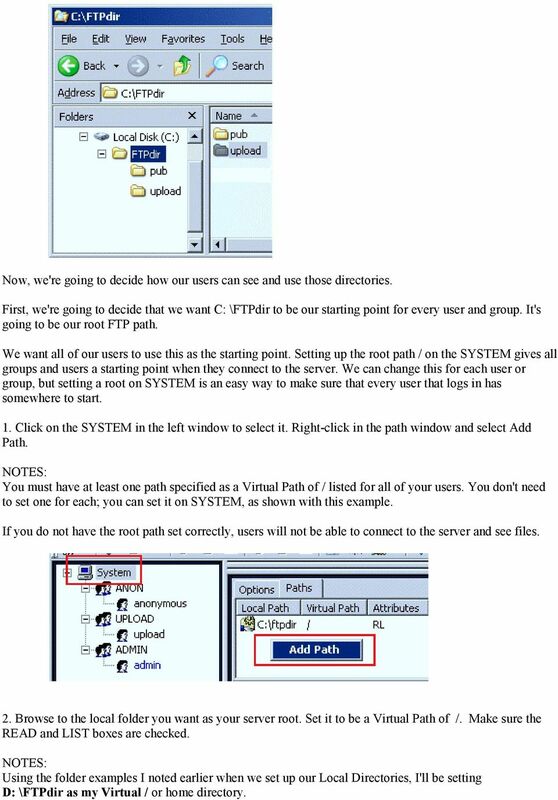 NOTES: You must have at least one path specified as a Virtual Path of / listed for all of your users. You don't need to set one for each; you can set it on SYSTEM, as shown with this example. If you do not have the root path set correctly, users will not be able to connect to the server and see files. 2. Browse to the local folder you want as your server root. Set it to be a Virtual Path of /. Make sure the READ and LIST boxes are checked. NOTES: Using the folder examples I noted earlier when we set up our Local Directories, I'll be setting D: \FTPdir as my Virtual / or home directory. 12 We're going to explain the READ and LIST check boxes later, so don't worry about why we checked them now. 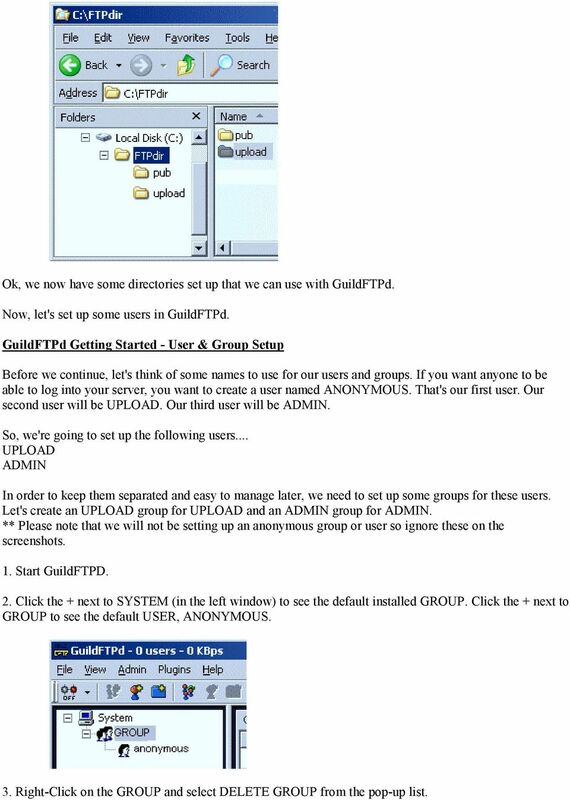 Ok. We've got our starting folder set up for the FTP server. Right now, all users could see if they logged into the server is an empty directory. Since we want to define some specific directories for them to see and use, let's continue by setting up an additional path for our UPLOAD and ADMIN groups. 1. Click on the SYSTEM in the left window to select it. Click on the ADD PATH button. 2. Browse to the local folder you want as your server's PUB subdirectory. Set it to be a Virtual Path of /pub Make sure the READ and LIST boxes are checked. NOTES: Using the folder examples I noted earlier when we set up our Local Directories, I'll be setting D: \FTPdir \pub as my Virtual /pub or home directory. This gives all of your users a path to download from. If you save files into this directory, everyone that connects to your server can download them. 13 3. Click on the UPLOAD group in the left window to select it. Click on the ADD PATH button. 4. Browse to the local folder you want as your server's UPLOAD subdirectory. 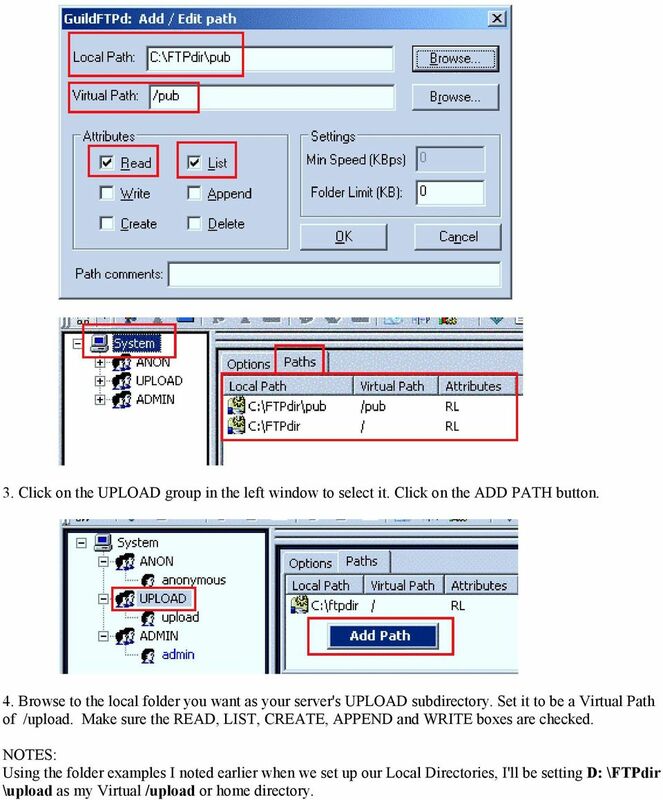 Set it to be a Virtual Path of /upload. Make sure the READ, LIST, CREATE, APPEND and WRITE boxes are checked. 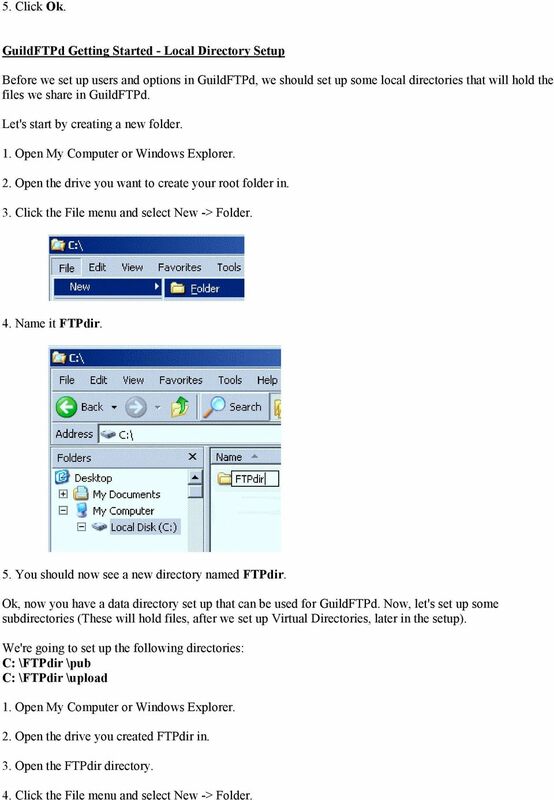 NOTES: Using the folder examples I noted earlier when we set up our Local Directories, I'll be setting D: \FTPdir \upload as my Virtual /upload or home directory. 14 5. Click on the ADMIN group in the left window to select it. 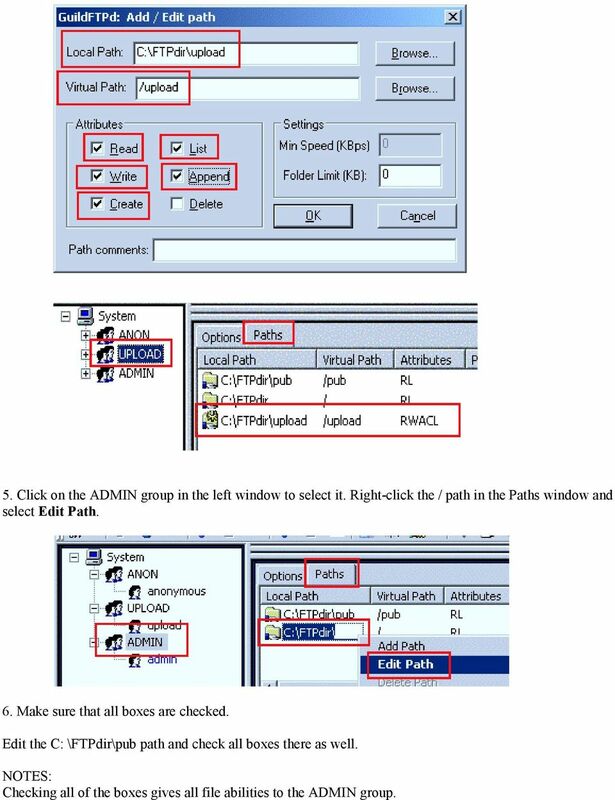 Right-click the / path in the Paths window and select Edit Path. 6. Make sure that all boxes are checked. Edit the C: \FTPdir\pub path and check all boxes there as well. NOTES: Checking all of the boxes gives all file abilities to the ADMIN group. 15 Now it's time to set up some server settings that control how users can log in, how long they can be using your server and what else can be done to control them while they are connected. GuildFTPd Getting Started - Server Settings First, let's make sure that there aren't any restrictions on what users or computers can connect to the server. We can do this by checking for IP Masks and Ban List entries. Both of these are described in more detail in the Advanced section of this help file. For now, let's just make sure there aren't any set up. 1. Click the Admin menu and select Edit IP Mask. Delete any or all entries that exist, if any do. 17 3. Click on each of your GROUPS and USERS [WINDOW A] to select them and make sure that none of the boxes in the lower right OPTIONS window are checked and that all show ACCOUNT ENABLE set to ENABLE. You may need to click the OPTIONS [WINDOW D] tab at the bottom to see them. 4. 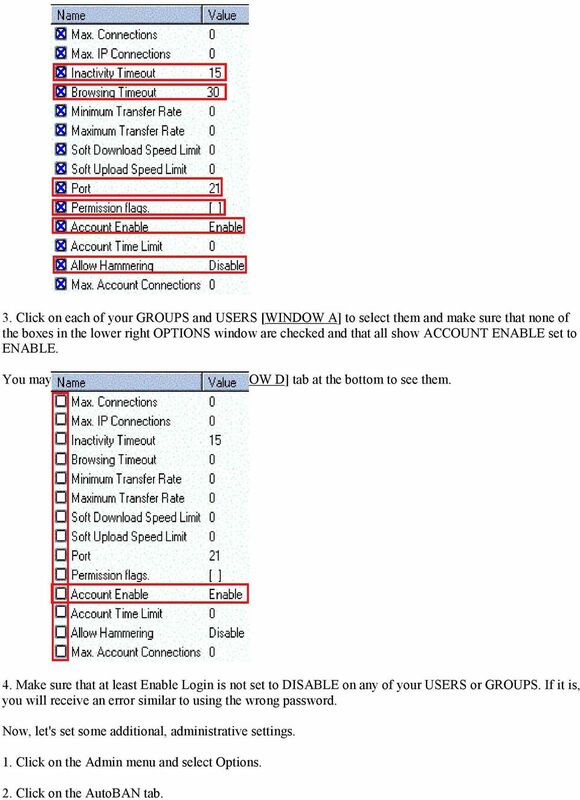 Make sure that at least Enable Login is not set to DISABLE on any of your USERS or GROUPS. If it is, you will receive an error similar to using the wrong password. Now, let's set some additional, administrative settings. 1. Click on the Admin menu and select Options. 2. Click on the AutoBAN tab. 18 3. Uncheck the AutoBAN on NOOP. 4. Click on the DDE tab. 5. Uncheck the Enable DDE option and click OK. Now, let's set some server messages. These are messages that users will be able to see and read when they log into your server using a FTP client. 1. Click on the Admin menu and select Server Messages. 2. Click on the PRE-LOGIN tab. 19 3. Enter a message you'd like your users to see when they first connect to your server and then click OK. Now, it's time to reset the server and test your setup. 1. Click on the Admin menu and select Restart Server. 2. 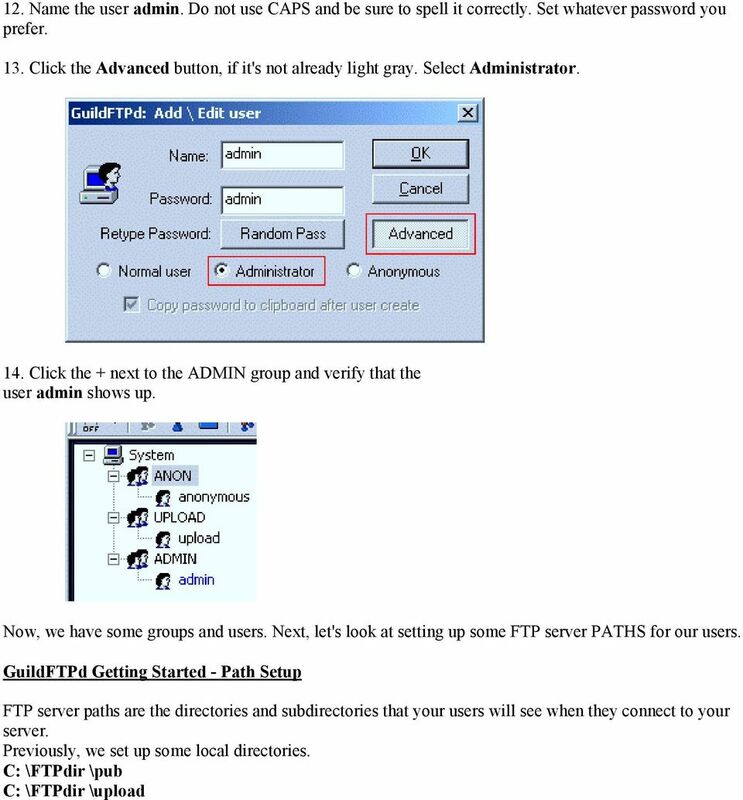 Open a FTP client and connect to your server on port 21 as each of the users. You should now be able to connect and use your new FTP server on port 21. Congratulations!!! EOS Step-by-Step Setup Guide Wireless File Transmitter FTP Mode Infrastructure Setup Windows 7 2012 Canon U.S.A., Inc. All Rights Reserved. Reproduction in whole or in part without permission is prohibited. 5. At the Windows Component panel, select the Internet Information Services (IIS) checkbox, and then hit Next. Remote Desktop Setup and Connection Instructions (Windows XP only) Overview Remote Desktop is a feature available with Windows XP that allows you to log in to your computer at work from another location.